Tonight we had the first meeting of the Kiama Sustainability Advisory Committee at the Council Chambers in Kiama. This first meeting was basically for all the committee members to meet each other, to review our Terms Of Reference, to get a brief overview of current sustainability projects in our municipality, and to figure out what we’ll be doing going forward. There are 9 committee members – three Councillors (Ben van der Wijngaart, Monique Dare-Ward and Neil Reilly), two Council employees, and 4 community representatives (one each from Gerringong-Gerroa-Werri Beach, Kiama-Kiama Heights (me! 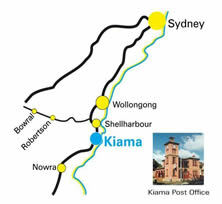 ), Kiama Downs-Minnamurra-Bombo, and Jamberoo). I was really impressed at the variety of experience amongst the other members of the committee. Most of them have been employed in the areas of environment and sustainability for many years, with post-graduate qualifications and all sorts of project experience. I’ve been reading about sustainability for years and understand most of the issues, but to date I haven’t got much actual experience. Like Steve Pavlina says, one of the best things you can do is to join a group where you just barely qualify for membership. They’ll pull you up to a whole new level. OK, so some of the advising bits might be left more to the experts on the committee, but I think I have something to contribute in many of the other areas. I’ve got an engineering and technology background, and certainly the “raising the profile” bit is something I’ve been trying to do with this web site! I think we have a really good mix of people with a wide range of skills, and we all share a similar motivation and interest in building a resilient, supportive and sustainable local community. I’m looking forward to learning more about the projects currently underway and planned for the future. It’s nice to be able to share good news from a local council – especially in this region! I’m On The Kiama Sustainability Advisory Committee! It’s great to know that our community is being shaped by such enthusiastic people – thanks. I also appreciate reading the informative articles you post. You’re doing a terrific job. Thanks, great to see another Super Challenge blogger! I’ve subscribed to your feed and look forward to reading more about what you’re up to. By the way, I wasn’t able to leave a comment on your blog. The OpenID stuff just kept redirecting me, but never actually authenticated with wordpress.com properly. I’ll try again from another computer tomorrow to see if that’s the problem. Hi Karan! We found there wasn’t a lot of local Illawarra information out there, and that was partly why we started this blog. I think it’s really important share with each other, to recommend local businesses and resources, and to swap tips and ideas that work for our climate and our region. I hope I’m helping to do some of that!